Before Grand Café de Brink became part of family business Hotel Wesseling, it was known as Hotel-Café Mulder, on the Brink 30 in Dwingeloo. It already possessed a beautiful conservatory on the right side of the building. Brink 31, the left side of the property, used to be the residence of the head master of the Elementary School. In 1956, Queen Juliana visited the beautiful town of Dwingeloo for a ceremony. Reason: officially set use to the radio telescope. During her visit she also opened the conference centre behind Hotel Café Mulder. 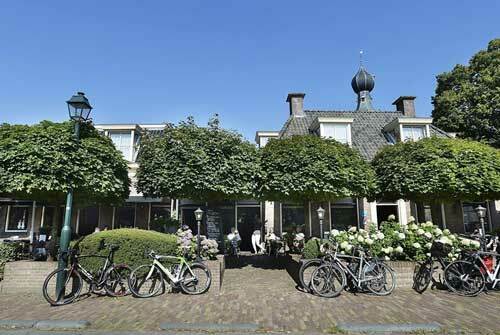 In 1990, Hotel-Café Mulder came up for sale and Henk Wesseling, the owner of Hotel Wesseling, commissioned an intermediary to start negotiations on his behalf. After all, it does not happen often, you can buy your neighbor's property. Henk Wesseling became the owner of the building, that also features 10 hotel rooms. In 1995 the children Annemarie and Erik Wesseling, along with their partners, took over the family business. Over the years, this led to a renovation in 2002. The entire property of Grand Café de Brink was stripped. Inside was newly built, but they restored the old style again, in order to maintain the beautiful charm. Today you can’t imagine Grand Café de Brink not being in the streets of Dwingeloo. In summer, it is a very popular place for tourists, thanks to the delightful terrace.